Is Forsythia Right for my Garden? Forsythia are so widely grown in the UK that they often overlooked nowadays. But they produce spectacular yellow flowers in early spring, are easy to maintain and very healthy shrubs. They also grow quickly so can be used as screening plants which will do their job much faster than most other shrubs. A deciduous shrub (looses its leaves in winter) which, if not pruned, reaches a height of 2.25m / 8ft with a similar spread. Forsythia grows at a rate of about 30cm / 1ft per year when established. It responds very well to pruning. It is fully hardy in all all areas of the UK, withstanding temperatures down to -18°C. In protected positions, it is hardy to a few degrees lower. Main interest is from the bright yellow flowers produced from late February to early April. All soils except heavy clay or waterlogged conditions are suitable. It does best in a deep loam type soil although this is never essential. It prefers full sun although also does well in partial shade. Avoid full shade positions. Once established, it rarely requires watering and will tolerate moderate drought. Pest and disease resistance is good with the exception of bird damage in some areas. See our section below on pests and diseases of this shrub for top tips about avoiding this problem. Choose a full sun to partial shade position. They will grow in shade but the flowering will be greatly reduced and they will also become straggly. Remember, they grow to 2.25m / 8ft high and wide after about 8 years so allow sufficient space for this. If you want to grow Forsythia as a dense hedge, individual plants should be about 1.2m / 4ft apart. We don't recommend forsythia as a hedge because it goes against its natural form of growth. For hedging we would recommend Berberis, Euonymus or Photinia. Forsythia are vigorous shrubs and the only care required, after they are established, is to prune them (see section below) correctly to encourage flowering in spring time. They are naturally deep rooted and will search out moisture well below the soil surface. On poor soils a couple of handfuls of blood, fish and bone per plant in April and September time will help feed the finer roots near the soil surface. 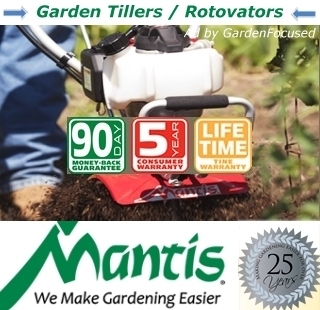 For younger plants up to two years old, water if conditions become dry. A twice yearly feed with blood, fish and bone in spring and autumn will help it to establish a good root system. Keep the area around the base of the plant free from weeds and grass. 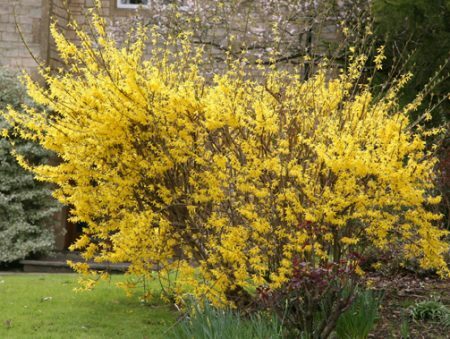 Although an established forsythia bush can be safely cut back virtually to the ground, if you want to maximise flowering it's best to prune them annually. For the first two to three years after planting a new forsythia, let it fill out and don't prune it. This will help it establish a good root system. The best time to prune a forsythia is immediately the flowers begin to fade. If you leave it a month or two later you will be reducing the show of flowers for next year. Forsythia flowers on stems which were grown during the previous two years. Prune to shape by removing about a quarter of the length from all stems. Every other year, prune about a quarter of all stems back to ground level from the centre of the bush. When doing the above keep an eye out for damaged stems and those bending over near to the ground. Choose to prune these first including stems which are crossing each other. Keep an eye out for Forsythia gall (see below) and carefully prune any affected branches which should then be burnt. If you inherit a very overgrown forsythia bush the best plan is to chop it back completely to a height of 1m / 3ft and let it grow away. It will produce very flowers the next year but will be fine by the year after. Forsythia are not suited to growing in containers, they are simply too large and too vigorous. There are a couple of companies selling dwarf varieties in the UK and claiming they are good for containers but these varieties are not sold by any of the better known companies and for good reason. We would suggest a Philadelphus / Mock Orange as an excellent alternative for container growing. Even more flowering potential and they can easily be kept to the size of the container. Your forsythia is unlikely to be affected by diseases although Forsythia Gall and Capsid Bugs can occasionally be a problem - see below. The main problem which can affect them in some areas is that of birds, often finches, eating the buds. It's not particularly common but in some locations birds can feed on the buds of forsythia. Unfortunately, when they find this source of food they tend to come back again for more! They normally only eat the higher buds because they are afraid of predators if they go too low. There really is no preventative measure to stop this. You could try netting the forsythia until the flowers appear but it sounds like too much work for us. 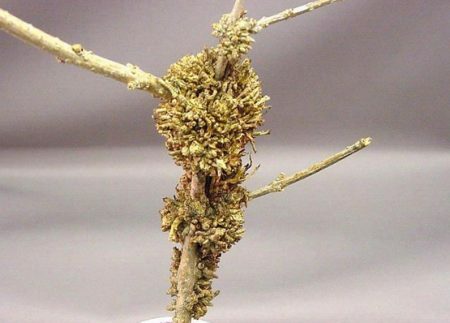 The symptoms of Forsythia gall are light brown raised growth areas on the stems with a ragged surface. They are easier to see and cut out in winter or spring when the foliage is not present. They are caused by the fungus Phomopsis. There is no chemical sprays or treatments available to kill the fungus so the best course of action is to cut affected stems away to reduce the spread. Cut cleanly about 10cm / 4ins below the gall and burn the stems to prevent re-infection. Damage from Capsid Bugs is almost always noticed after the bug has disappeared and started to damage another plants. The flowers will show damage to the edges when they emerge, sometimes with holes in the petals. The leaves are also often attacked and show small holes in them which can be quite extensive. They are most common from May to August. If you suspect that Capsid Bugs will damage your forsythia then spray regularly with an insecticide such as Scotts Bug Clear or Doff All-in-One Garden Pest Killer. 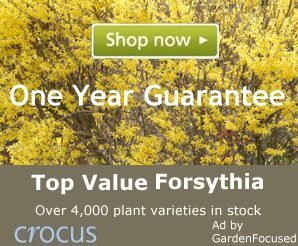 The development of new varieties of Forsythia is very limited because the few varieties currently available are hard to better. We recommend three below which offer spectacular spring colour. The classic Forsythia which is less likely to suffer from gall compared to others. Masses of bright yellow flowers are almost guaranteed every year. The height at maturity is 2.25m / 8ft with a similar spread. Regular pruning can reduce the size by about 25%. It grows upright and responds well to even the most amateur pruning. Has an Award of Garden Merit. Available online from our recommended suppliers Crocus here with a one year guarantee. Flowers appear a week or two later than Lynwood and last a week or two longer, they are also slightly larger. The height at maturity is 2.25m / 8ft with a similar spread. This variety was bred in Germany and flowers well on one year old stems, earlier than other varieties which flower on two year old wood. One of our favourites, available from our recommended suppliers Crocus here with a one year guarantee. Below we list the key strengths and weaknesses of Forsythia.